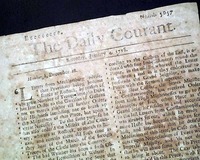 THE DAILY COURANT, London, Jan. 4, 1718 This was the world's first successful daily newspaper, and is a landmark issue for any newspaper collection as such, having begun in 1702. 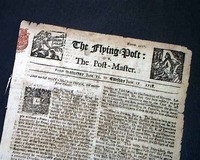 As would be imagined the issue is almost entirely taken up with various European reports, with half of the back page taken up with advertisements. 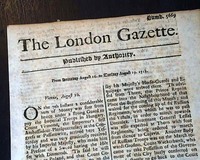 This was the world's first successful daily newspaper, and is a landmark issue for any newspaper collection as such having begun in 1702. As would be imagined the issue is almost entirely taken up with various European reports, with half of the back page taken up with advertisements. 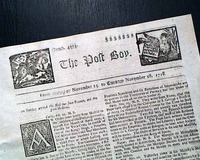 THE POST BOY, London, April 1, 1718 A handsome issue with the two nice, detailed engravings in the masthead. 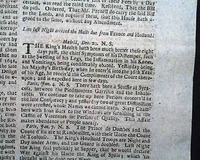 The backpage contains an article "On Saturday Night the Assizes ended at Kingston, where 15 Persons received Sentence of Death... 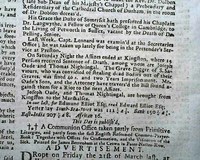 The Grave-Digger of S. Saviours, who was convicted of stealing dead Bodies out of their Graves, was fined 40 s. and two Years Imprisonment..."
In 1695 the Licensing Act of England was allowed to lapse, which caused several newspapers to begin publication, this title being one of them. But this is certainly one of the more rare such titles as we have only offered 4 or 5 in the past 40 years.